HomeSoftware Testing Services What is QA Outsourcing? What are Software Outsourcing Services? What is QA Outsourcing? What are Software Outsourcing Services? QA outsourcing is an arrangement in which one company transfers some production functions and business activities to a third party service provider that specializes in the desired field. But, unlike the one-time or occasional support, in this case it is the transfer of outsourcing functions for professional maintenance of individual systems performance under a permanent contract (for a period of 1 year). IT-outsourcing – in most cases it is programming; website development; software development and software maintenance; equipment maintenance (peripheral configuration: printers, mouse pointing devices, scanners). Also, it can be the development of very large and complex computer systems as in the case of data centres. Manufacturer outsourcing is the transfer of some production functions to a third party manufacturer. For instance, advertising agencies, which use printing-offices and their printing facilities or wineries and bottle wine under their own brands. Business process outsourcing is the transfer of an individual business process (or several processes) to an executing agency, at that these are not key processes. Among them are accounting, human resources management, advertisement, logistics, marketing, etc. Knowledge management outsourcing is the management of those kinds of processes that require more in-depth study or serious analytical processing of large amounts of data, creation and management of knowledge base (KB), which subsequently will be used to support decision-making. This type of outsourcing has just started to gain popularity in the USA. In order to successfully outsource testing you need to choose out from unlimited potential outsource testing solutions: contractors, interns, employers and so on. These know the difference between software testing and software quality and can build a strategy to satisfy your technical and business goals. Lets us focus on one of the types of outsourcing services, namely IT-outsourcing. This outsourcing involves the transfer of information systems to a third party service provider. Generally speaking, in order to run a successful business today it is not at all necessarily to perform all functions of the company with the help of its workforce, because you can shift responsibility for the management of these processes from the company onto a specialized organization. The company, taking upon itself “foreign” functions is called outsourcing company or an outsourcer. It is worth mentioning that software testing outsourcing helps to improve software development life cycle, ensure software quality assurance and reduce IT expenses. 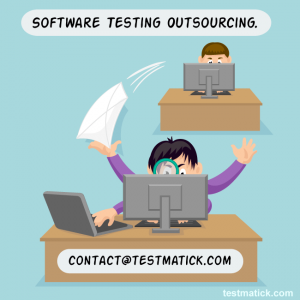 Software Testing Outsourcing: When? What? Why?